Thermal comfort and air quality are two of the main objectives with the design of any air-conditioning system with energy efficiency ranking high on the list of required system attributes. That is why we have chosen the World leader in air conditioning systems "DAIKIN" as our primary solution provider. When considering an air conditioning system for your home or business it is important to be aware of and understand the range of options available where we provide the expertise and guidance in selecting a solution that best meets your immediate and future needs. Wall mounted heat pumps are a popular means of conditioning the air within a room, with a variety of models and sizes to suit individual circumstances. We are passionate about new technology where energy efficiency and performance are matched with stylish designs with many models having WiFi capability. Daikin's Floor standing heat pumps are an ideal means of heating and cooling a space with the airflow directed across floor level. Floor units can be recessed into the wall for a slimline finish and provide a great solution where a high wall application is not possible. Daikin ceiling mounted range of units provide options for heating and cooling a space where wall mounted solutions are not possible. Their sleek design provides directional air flow in up to four directions to evenly distribute tempered air to all zones within a room. A Daikin multi split air conditioner is a system that has one outdoor unit and multiple indoor units. The indoor units can be wall mounted splits, floor or ceiling consoles or even ducted bulkheads The benefits you have in efficiency are outstanding due to the ability to use only one room if that is all you need. With one outdoor unit controlling multiple indoor units a Daikin VRV(Variable refrigerant volume) system can provide heating and cooling, all at the same time to various indoor units and zones. Amongst the many attributes provided with VRV technology are the benefits of high energy efficiency, flexible operation, ease of installation, low noise, zone control, and comfort choices for cooling or heating. 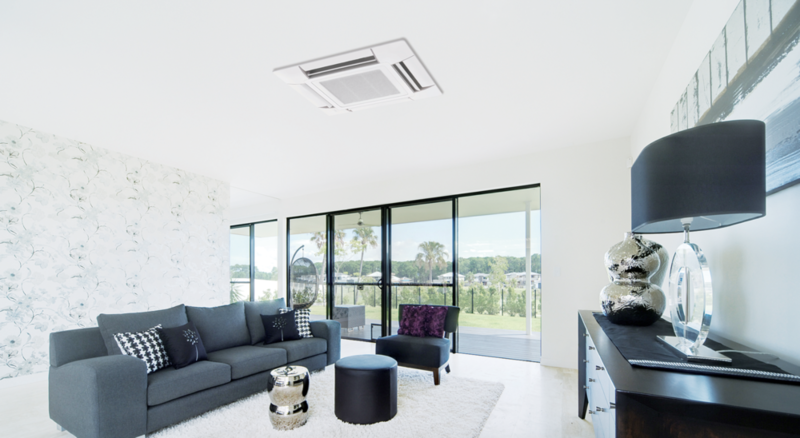 A Daikin ducted air conditioning system provides heating or cooling to numerous rooms all at one time via a network of ducts hidden within the ceiling void or under the floor. For further control and efficiency, a zone controlled system can be installed that will allow you to heat or cool selected rooms as opposed to air distribution to each space. The only visible features of a typical system are discreet ceiling diffusers, wall or floor grilles providing a streamlined and discreet finish to the conditioned space. If you would like to talk about what Daikin air conditioning solution will best meet the needs for your home or business then please contact us today to discuss your requirements.